Reservoir dogs from L to R: Mohit Jayal (MD Delhi), Buz Sawyer (MD New York) & Dave Luhr (Global COO). Picture courtesy Trish Adams (MD Tokyo). 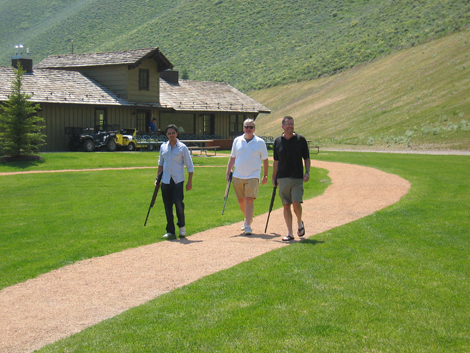 W+K’s MDs recently gathered in beautiful Sun Valley, Idaho, for a few days of strategic contemplation. Highlights included clean air, mountain biking, 12-gauge shotgun shooting, cow-eating and consumption of the famous American beverage ‘Dirty Bird’, a.k.a. Wild Turkey. Well worth the 30-hour journey (one way). Just when we’d almost forgotten about the Duckie spot two things brought it back to our notice last week. First, Shefali (our client at Nokia) returned from a scuba-diving holiday with a gift of a complete set of classic yellow-rubber-ducks ranging from a tiny 3 incher to a fairly large 8-10 inch version. We like getting stuff. Who doesn’t? Then, as if to repay the gesture, the commercial has gone on to become the most succesful Indian ad on tv in June beating a bunch of big celebrity endorsed ads in the process.